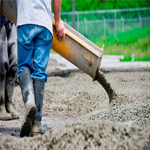 UAC concrete contractors are known in the industry as one of the most innovative and in demand concrete service providers. Our work focuses on commercial, industrial and residential services as well as government contracts and the full public sector. We have a range of services that includes everything from basement flooring, concrete driveways, concrete overlays, concrete walkways, epoxy flooring, outdoor kitchens, concrete resurfacing, concrete repair, concrete staining, concrete dyes, concrete patios, concrete polishing and much more. We have been working in the industry for many years now and our work is the envy of the concrete industry. 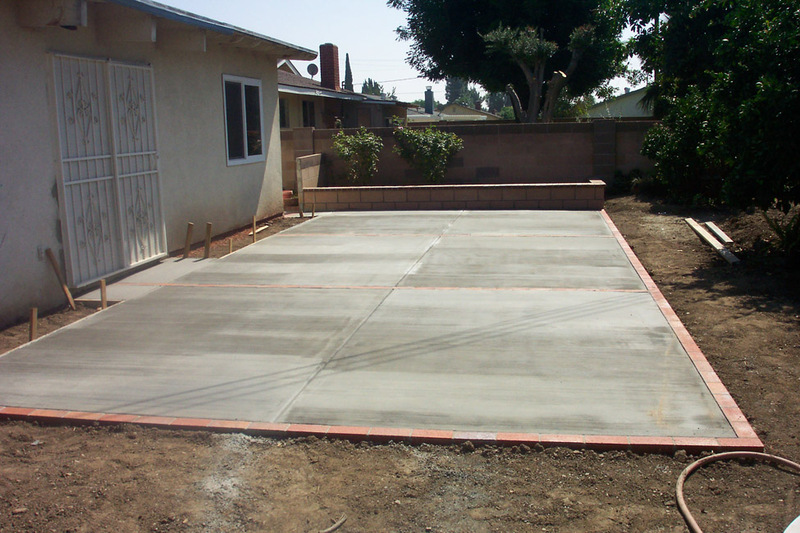 All of our concrete sales team and contractors are true professionals who have been working in this field for many years now and can give you direct and upfront pricing to give you a full idea of project cost. They plan by square footage and they take in to account everything from labor cost to materials so you can have a full understanding of how much the end number will be to complete the work. UAC Concrete Contractors also performs structural concrete pours and has helped lay concrete for some of the most modern iconic buildings in America which is something we are very proud of. We work with many onsite contractors as a team to get a job finished. 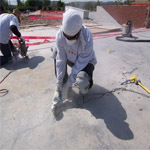 We know when dealing with any concrete that timing is everything so other guys to come in and do their work. We make sure to always keep in contact with the onsite manager to make sure we are ready to come in and do our work in the allotted window of time. 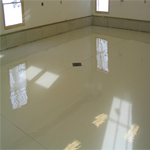 We also concentrate on industrial and commercial floor maintenance which varies from stain removal and crack filling as well as surface refinishing. Being in any of these environments you really want to make sure your floors are level and crack free as any damage to the floor could turn in to a nasty accident for an unsuspecting member of the public which will in turn most likely turn in to a lawsuit against your business. We have resurfacing finishes that will not only repair floors but treat them to withstand abuse from chemicals that can cause corrosion and abrasion. The coatings will also make sure that the floors hold up to extreme temperature and they come with a low maintenance finish that is nice and easy to clean. Once we establish what your business does we will provide you with the correct and relevant solution for your business. Should this be an epoxy that will serve as a solution to an electronics plant or FDA approved facility or even an arena or airport? 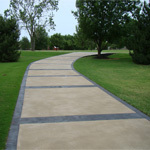 We have concrete solutions to suit any business and public area. Our networked team of designers, surveyors and engineers all come with their strengths and team up to work on each project to make sure you are getting the attention that is needed to bring this project you have planned for to fruition. And it will all be done working within an agreed and to a deadline that is stated by the customer with no delays along the way because of great planning. Since the business was founded back in 1986 we have slowly grown to where we have a point of contact in every state in America. Our once small company has turned in to a vast network that links customers with qualified and licensed contractors who specialize in a multitude of concrete and flooring business services. We always like to think here at UAC Concrete Contractors that no matter what flooring dilemma you might be facing we have an answer for you. 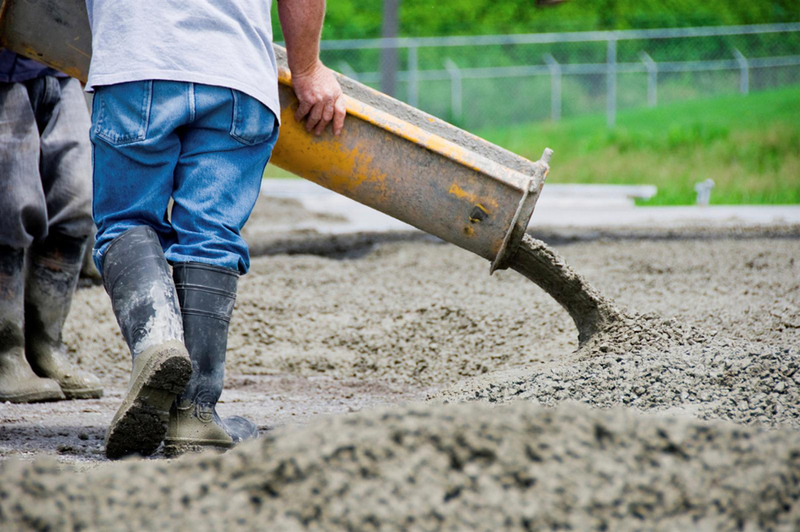 If you are looking for a professional company that deals with concrete pouring then we can deliver that service for you with our team of experienced contractors. 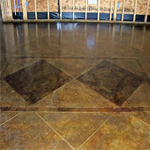 Should you be looking for someone to refinish your floors with a concrete coating to protect the integrity of the floor then we have a team just strictly dedicated to providing that service for you. 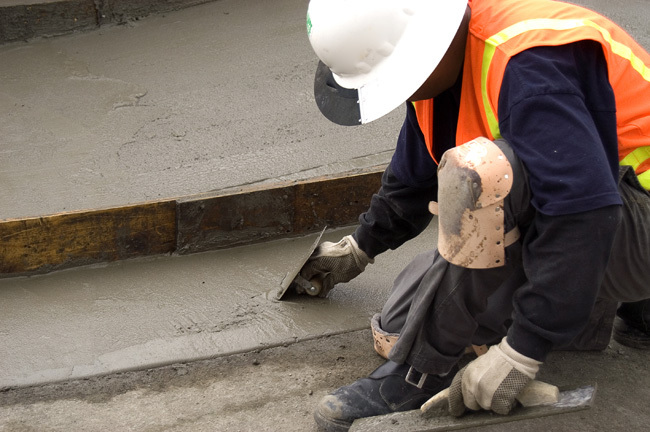 Our concrete replacement and repair team use only the finest material which makes our concrete twice as strong as other concretes. 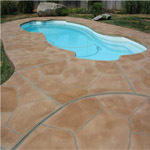 We can even customize the color of the concrete and we have an easy install policy. They have a very high resistance to wear and tear and salt resistance which not only makes the concrete last longer you will also find in does not crumble. 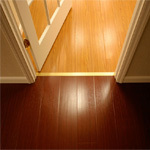 We install our floors to make sure they last and they are not only durable but they will serve you for a long time. We have fixed and installed sidewalks and other public walkways and we are always complimented on the smoothness of our jobs which make it easy for people to get around without having to worry about trip hazards. Our floor coating is also designed for spaces such as parking lots and public areas that have a high amount of vehicle traffic. 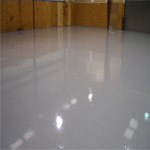 We have specially engineered floor coatings that stand up to different weather conditions such as snow, ice and water. All of them are skid resistant and low maintenance making for easy cleaning. 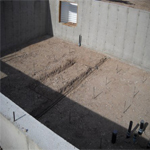 We do not only deal with big commercial and industrial projects we also focus on residential and smaller projects such as garage floors, basement floors and pool areas. We even deal with in home flooring solutions. Why look at an ugly garage floor, we can come in and install a new coating that will transform your existing floor in to something special. We have epoxy finishes that come with flake finishes that can transform any space in to an area that will benefit not only the look of the property but add value and practicality to it. We will give you a truly professional plan of repair. We take the time to do our work right. There will be no short cuts. We use the proven, powerful, and permanent Pro-Lift System. Basements can be prone to dampness and flooding on occasion depending on where you live so it’s important that you have the correct flooring down there. 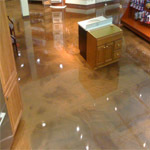 While tile can be great it can still get lifted with harsh flooding so we think an epoxy could be the way to go. People do enjoy carpeting in basements as it gives it a warm feel but it’s really not that great because more than likely it’s going to experience dampness at some point. 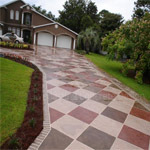 We can provide a sealed and impressive looking driveway for you that will not only protect against the elements outside it will be the envy of the neighborhood. 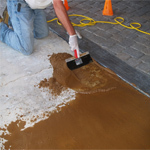 Our team specializes in the tricky installation work like the concrete pouring and sealing so you have a finished driveway that looks very impressive. 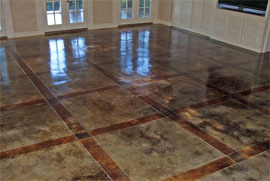 A fast and effective solution to bringing life back in to an old worn out floor would be a concrete overlay. A good self leveling overlay not only provides an economical solution to any flooring need they also provide a great look when done right. If you have uneven floors then self leveling solutions could be the most perfect solution for you. 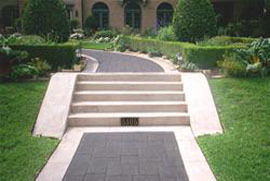 A sidewalk or walkway does not have to be bland and substandard. 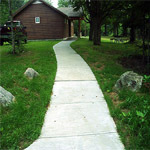 And a walkway should be level and free of damage to stop any potential trip hazards. 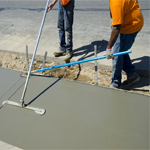 The standard sub cement look is normally a flat concrete walkways and sidewalks finish. Our epoxy flooring division is dedicated to installing smooth and hardwearing floors throughout homes and commercial buildings. They not only stand up to wear and tear and are very easy to clean they are becoming a modern feature in a great deal of homes today. There is nothing more pleasurable than cooking in the great outdoors and if you are looking to have a floor installed around the area you will need something that’s easy to wash down and will stand up to any food grease being dropped. 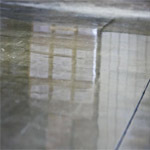 To resurface a concrete floor is to bring it back to life in a sense, concrete can get abused by rust stains, oil leaks, chemical stains and just general weather and foot traffic wearing it down over the years. 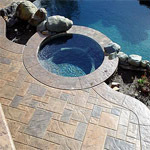 When we describe stamped concrete we refer to patterned and textured concrete that is made to look like tile, slate, brick and other flooring finishes. 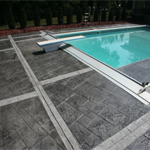 We use stamped concrete to finish driveways, swimming pool areas, sidewalks and commercial walkways for offices. 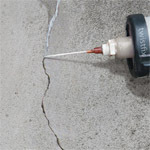 Cracks in concrete happen more frequently than you can imagine. 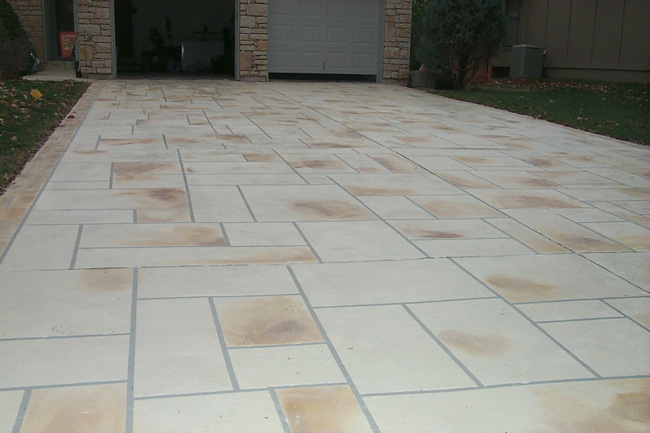 It can be from weathering or from the point of installation where the concrete has moisture causing shrinking as it hardens. In hot weather shrinking can occur very early after the slab has been set. 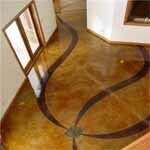 To dye concrete is to make it more interesting, at least that’s what we think here at UAC Concrete Contractors. 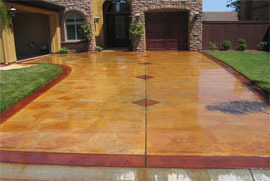 The reason why we think that is a grey concrete slab can look very dull unless you polish it and clear coat it. 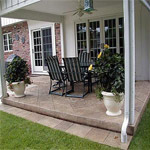 During the summer months most people like to use their patio as the place to entertain guests, have cook outs and just generally relax. That is why it’s nice to have an area that looks good and a place you enjoy. 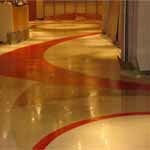 Concrete polishing is a technique that is not only very cost effective in making a floor look modern and new. 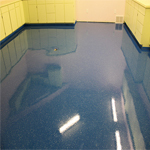 It also provides a very durable floor that looks high gloss and will last for decades with minimum maintenance. A plain grey concrete slab is not the most thrilling thing to look at, not only is it a cold look to have it also provides nothing in the way of design. But what you do have is a blank canvas that can be turned in to something special. 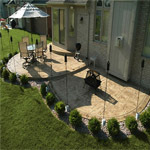 We like to make sure that every job we complete, we complete it with 100% customer satisfaction. 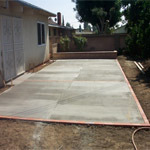 At UAC Concrete Contractors ensure that every job is completed and done to your satisfaction. Please feel free to contact us if you have any questions regarding our services or to schedule an appointment. You can reach us by calling our toll free number. 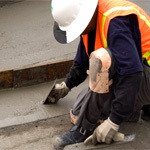 Thank you for visiting our website and we hope to hear from you if you need concrete contractors. Basements can be prone to dampness and flooding on occasion depending on where you live so it’s important that you have the correct flooring down there. 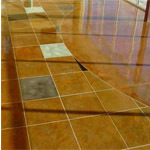 While tile can be great it can still get lifted with harsh flooding so we think an epoxy could be the way to go. People do enjoy carpeting in basements as it gives it a warm feel but it’s really not that great because more than likely it’s going to experience dampness at some point. And dampness can attract mold and water damage so it’s better to go with a nice epoxy that is water proof and easy to clean. You can always add some nice rugs in the space to give it a warmer feel and pick a nice bright epoxy floor paint color. 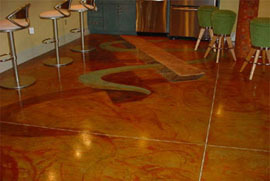 Epoxy floors are also good with different temperatures and they can come in many styles and finishes. They are considered safe and slip resistant and they minimize tracked dirt and are easy to mop down with a damp mop or even vacuum. Our company also deals with basement concrete repairs, so if you have any cracks and uneven flooring we can take care of that for you. 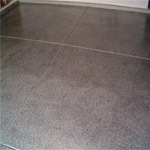 We have resurfacing options which can bring that basement floor back to life and make it look like new. 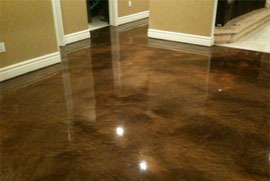 Our basement floor coatings will be good for moisture protection that will seal the basement floor. It protects against mold and it will also be economical to install when compared to tile and carpet and wood flooring options. 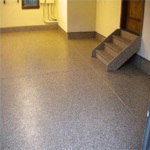 If you have any other questions about floor coatings for basements then we will be happy to help you out. So if your basement needs any of the following. 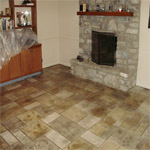 We will be able to assist you with all of the above and it will transform your basement floor for the better. 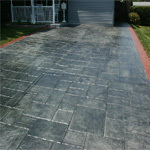 We specialize in driveway resurfacing and refinishing. 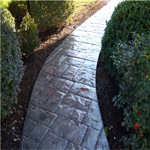 There are many styles and options to go for from decorative driveways to plain poured concrete driveways. 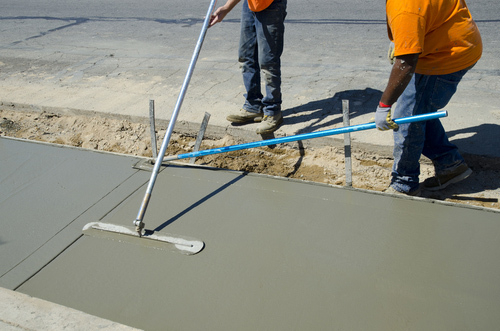 Our team at UAC Concrete Contractors really does use the best quality products to get the job done. With a dedication to not only providing the most effective flooring solutions we have a vast knowledge of how to refinish floors. 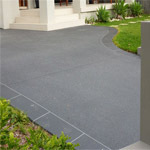 Some of the options that people like to look at when looking for a new driveway are. 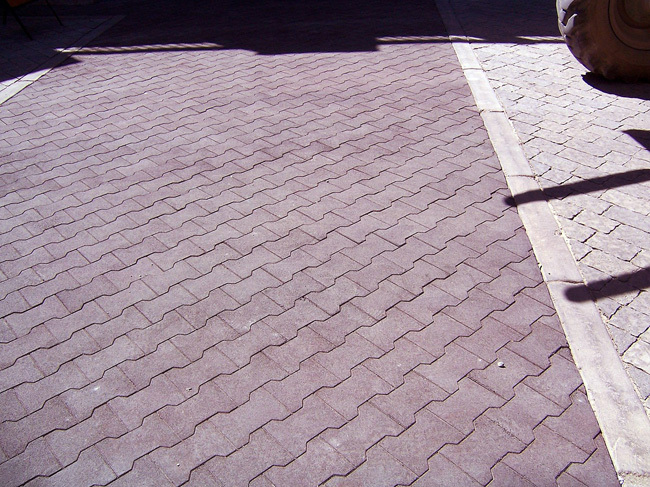 Block Paving – This is known in providing great strength with any block paving and you are free of the driveway shifting or cracking. It’s very high quality and long lasting and the only thing you need in the way of maintenance is power housing every 5 years or so. 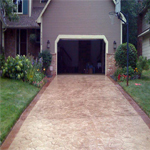 Concrete Imprinted Driveway Solutions – These driveways are sealed which means weeds will for sure not find a way through. And with a good mix of options and color choice you really will have a fantastic range of designs for a very unique and customized look. 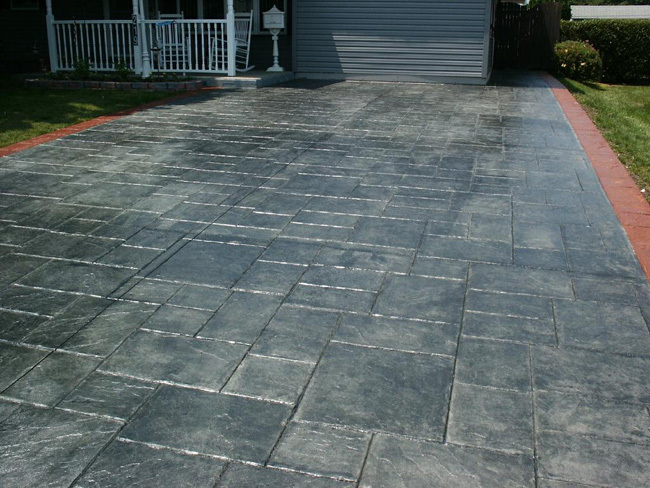 Stamped Concrete – Look like the real thing but its half the price, more and more this is becoming the primary option for anyone looking to get a great looking finished driveway. Not only is it strong and resourceful way to finish a drive it comes with a great seal that will last you a very long time. 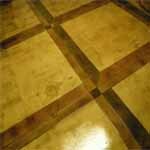 A fast and effective solution to bringing life back in to an old worn out floor would be a concrete overlay. A good self leveling overlay not only provides an economical solution to any flooring need they also provide a great look when done right. 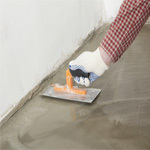 If you have uneven floors then self leveling solutions could be the most perfect solution for you. What can be then achieved once the overlay is done is polishing and staining to give it a fantastic look that stands up to wear and tear. The good thing about the floors are the turn over time for install is very quick meaning down time is to a minimum while waiting for them to set. The advantage to this is you can have them polished more or less the next day. 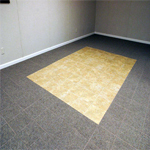 With an aggregate also fed in you can expect the floor to have much more depth and style. Skim coats can be added which will not add to much additional thickness but if you wish you can go thicker of about an inch or more. You can really notice the difference once a concrete overlay has been added. Some of the options you have and their application use are as described below. 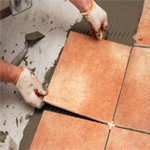 Underlayment – This is applied in prep for flooring covers. It is used to bring about a level and clean finish. 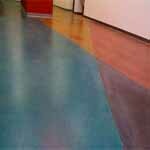 Micro Toppings – Any great mega thin coating system gives you a polymer centered floor that can flex if need be. 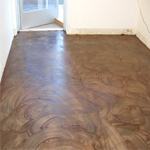 Self Leveling Overlays – This is used to bring back any floors that are cracked and are looking slightly worse for wear. They are even self-leveling and they provide the perfect opportunity once the work has been carried out to apply a stained and polished finish. 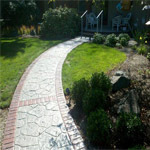 A sidewalk or walkway does not have to be bland and substandard. 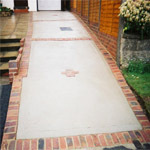 And a walkway should be level and free of damage to stop any potential trip hazards. 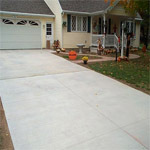 The standard sub cement look is normally a flat concrete walkways and sidewalks finish. 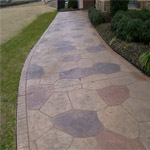 But we can change all of that with varieties of stamps, patterns, molds, colors, and stains to improve your walkway in not only a cosmetic way but give it more of a sturdy feel. The good thing about updating your sidewalk is you can choose from a nice flagstone configuration. 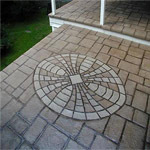 These are very cost effective and provide a great look. 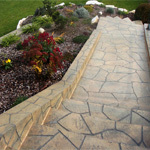 There are also slate pattern walkways that are sturdy yet striking to look at. 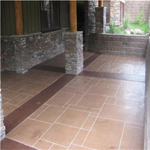 Slate stamped sidewalks incorporated in to a porch can also look very modern. And depending on your style of house and location some of our customers request a baked clay look as it can give the walkway a warm feeling. 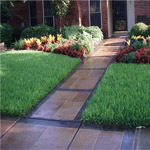 Ultimately your sidewalk not only needs to look nice but needs to be practical, this can mean that it’s easy to clean with low maintenance, slip free to save anyone getting injured and weather resistant to hot summers and harsh winters. It needs to be strong and flex slightly if you live in an area that suffers from seismic activity which is known to cause cracks. 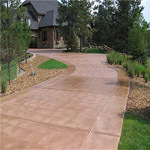 We will look at your driveway and do an inspection and figure out the best option for you. We can also work with various budgets to come up with a solution that will not only look fantastic but serve you for a long time. Our epoxy flooring division is dedicated to installing smooth and hardwearing floors throughout homes and commercial buildings. They not only stand up to wear and tear and are very easy to clean they are becoming a modern feature in a great deal of homes today. We use to install the majority of floors in residential garages but now we are seeing an increase of clients requesting to have the floors installed in their homes. With a massive selection of colors and finishes epoxy is not what it used to be, it is now used in art galleries to provide them fantastic bright white floors when you walk in to give an open space feeling and it also reflects light back in to the room. We also use different epoxy coatings in many commercial settings, from warehouses to hotels and even shopping malls and retail stores it’s been a favorite for many years because of its low maintenance ability and easy to clean attributes. 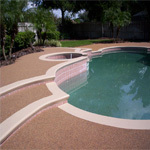 It also comes in many styles from metallic looks and deep colors that normally impress customers. 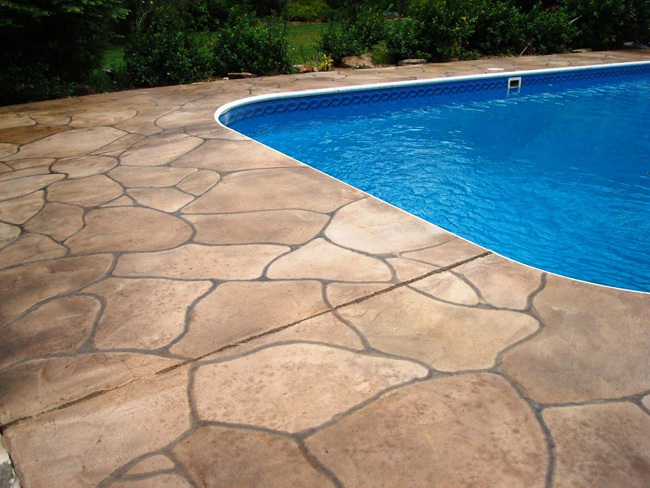 Epoxy can even be used around pool areas, with a strong 2 part epoxy it is a fantastic sealer and helps with a special non slip coating. Some of our biggest jobs we have completed have been airport hangers; we have special coatings that dry quick meaning there is a quick turnaround time so the hangers can be used without too much hassle. They also handle the heaviest loads from commercial liners to privet jets. With this being the most requested coating for our airport division we also have a large stock of it available to make sure we can get a job done instantly. 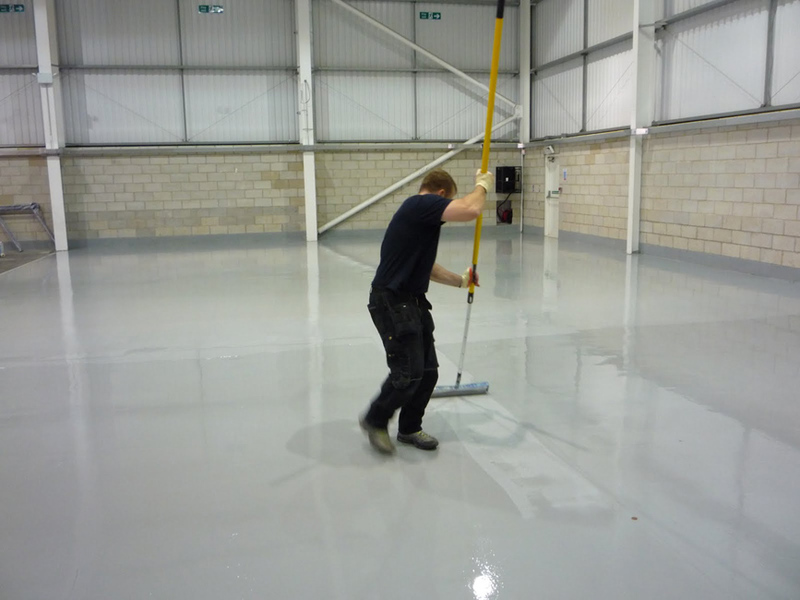 If you have been considering an epoxy floor then we have the knowhow and the technology to get the work done for you. 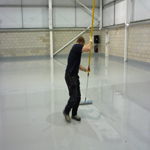 Should it be residential or commercial we have specialist epoxy teams that deal with both. 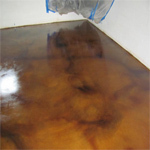 They will guide you through the epoxy coating process and answer any questions you might have and make sure the task is carried out with no problems. 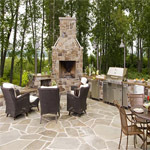 There is nothing more pleasurable than cooking in the great outdoors and if you are looking to have a floor installed around the area you will need something that’s easy to wash down and will stand up to any food grease being dropped. 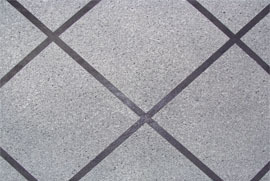 You also want to think about safety being the number 1 factor so you want to steer clear from tiles that can become a hazard when damp. We work with flooring options that will be safe for you to walk on like concrete for its durability and stone for its strong natural qualities and brick for its nice look. 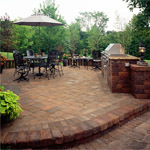 There is also the choice of how you want your outdoor kitchen to look. Traditional will normally be a mix of brick and flagstones, you can also go with a stamp concrete to give that cobble stone effect. 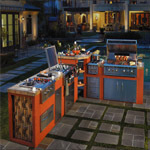 Tiki is normally that tropical quirky traditional look to fit your outdoor kitchen in. You can get an epoxy sand effect that is easy to wipe down or stick with a pebble textured stamp concrete look. 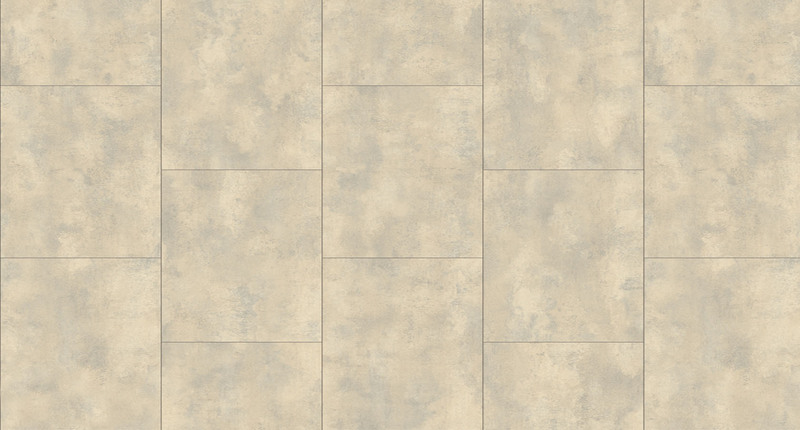 Modern would be a good slate finish or cut concrete look that can be polished to provide a nice modern floor. 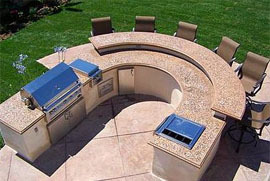 So with just a few options we have provided you for outdoor kitchen ideas you can see we really do know how to give you that look you want. If you are still not sure then please give us a call and have one of our experts meet you and talk about your outdoor kitchen project. We can help with anything from the floors to the general equipment needed for cooking and even the stone work. 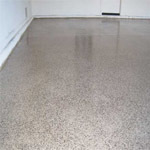 To resurface a concrete floor is to bring it back to life in a sense, concrete can get abused by rust stains, oil leaks, chemical stains and just general weather and foot traffic wearing it down over the years. Since it’s a big job and a very expensive job to dig up the old concrete to re-pour it we suggest looking at resurfacing the concrete floor. It’s far cheaper and just as effective in providing a smart, smooth and seamless finish. We suggest if you are looking to resurface the concrete then call us so we can look at the condition of the floor and make our assessment. 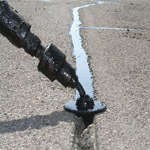 From here we can gauge the type of resurfacing you need and the best product to get that done. With so many great concrete resurfacing products and finishes on the market we choose the best to make sure the floor will last for many years to come. 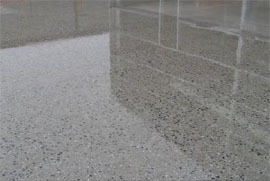 Resurfaced concrete benefits from having a good quality sealer added which makes the top surface much easier to clean and it helps keep the floor safe from weather conditions and stains. 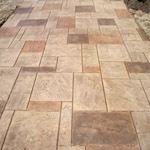 When we describe stamped concrete we refer to patterned and textured concrete that is made to look like tile, slate, brick and other flooring finishes. 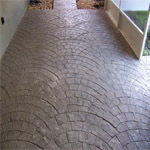 We use stamped concrete to finish driveways, swimming pool areas, sidewalks and commercial walkways for offices. 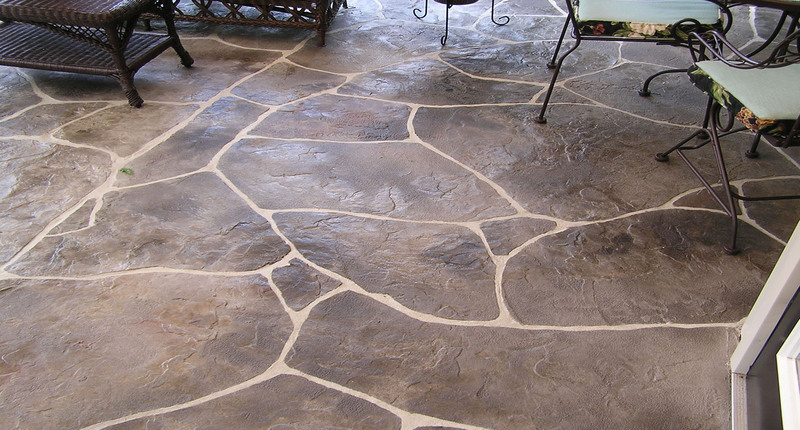 The great thing about stamped concrete is it’s much cheaper than using the materials it’s imitating. 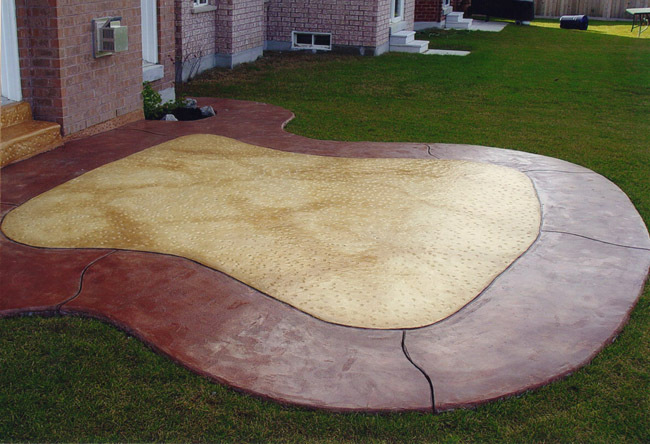 Stamped concrete is not only strong but it looks very realistic just like the genuine product. 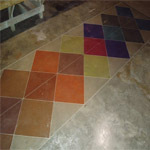 And with an array of colors and patterns you really can have an amazing finished floor. 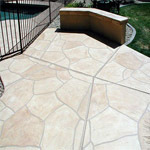 When adding a color it’s a simple task of adding a powder pigment to dye the concrete to the desired color. 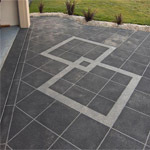 So if you want that natural stone look then we can achieve that look very simply by using the correct pattern stamps. 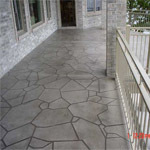 So if you are interested in finding out more about stamped concrete then we can show you and array of patterns and other finishes that you will find impressive. We can also work with any budget so it’s worth calling us to see what we can do for you. 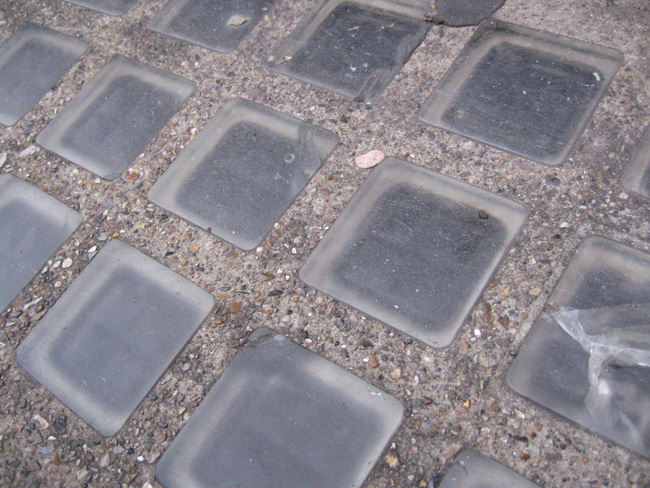 Cracks in concrete happen more frequently than you can imagine. 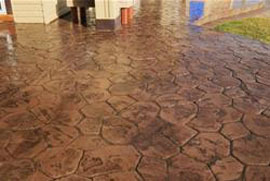 It can be from weathering or from the point of installation where the concrete has moisture causing shrinking as it hardens. In hot weather shrinking can occur very early after the slab has been set. Normally the cracks will start out as hair line but over time they will get bigger due to weathering and moister. Fixing the cracks is not such a task as we have the right resources to do so. With crack sealers and concrete joint filler’s we can get the task done first time. We look at each crack based on the depth and width of it. 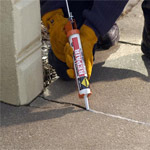 Depending on the size it will determine the application that is need to fill the crack in the concrete and fix it. The sooner it’s fixed the better because if left cracks will only grow and get bigger and bigger. Because concrete shrinks on application we make sure the right consistency and amount is used to account for this. We also pick the best day’s weather wise to get the job done. 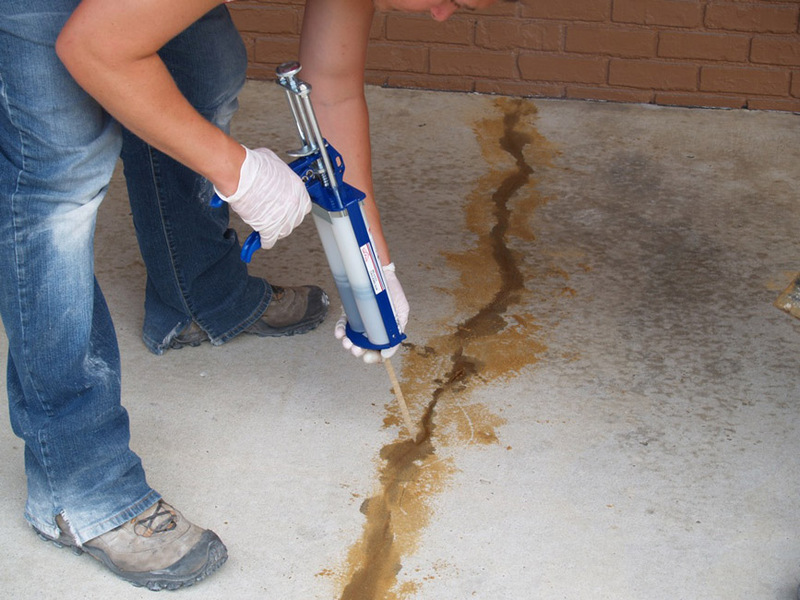 If it’s too hot or cold it can affect how the concrete is poured to fix the crack and how it will react. All things need to be considered when you repair any concrete floor, it’s important to the stability of the concrete and how it sets in the cracks. 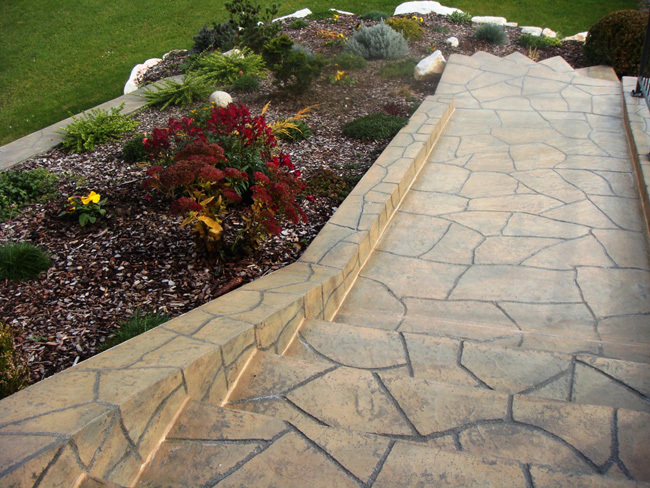 To dye concrete is to make it more interesting, at least that’s what we think here at UAC Concrete Contractors. 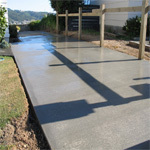 The reason why we think that is a grey concrete slab can look very dull unless you polish it and clear coat it. 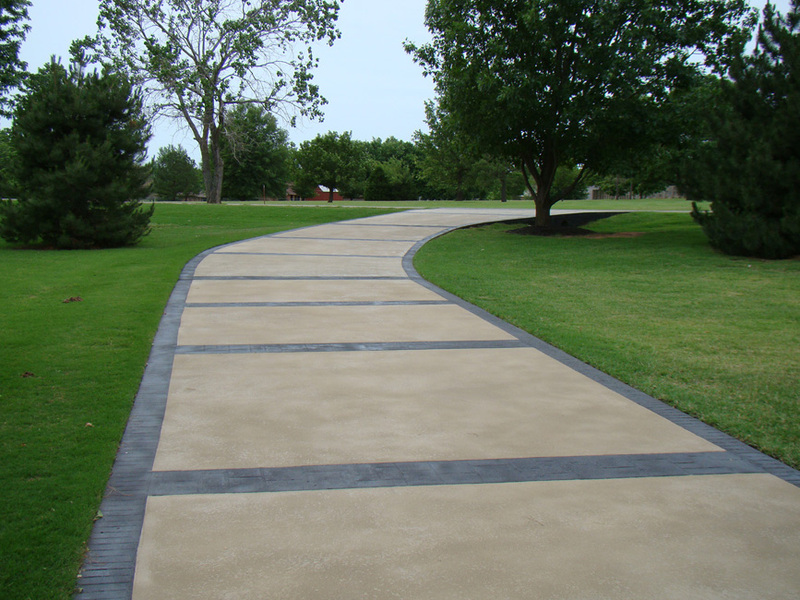 But what can make concrete more appealing to the eye is some color. And we have a vast selection of color that can not only brighten up any floor and enhance it but we can even work on designs. 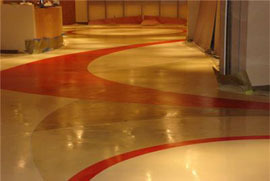 We have a large range of concrete dyes that can be used on interior floors and exterior floors. They are very economical and they are also very fast drying. The good thing about dying the floor is it really does transform a space in to something special. 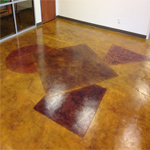 You can dye the floor yourself but the trouble is if you make one mistake you can be stuck with a very odd looking floor color, which is why we suggest you call us here at UAC Concrete Contractors to give you a quote on getting the job done right. Our pricing is fair and you will find that we will get it done quickly with 100% accuracy. We have had customers attempt to do it themselves in the past and as they tried to fix it a few times spending on material each time and burning through their free time. In the end it cost them more than what our initial quote would have been to do it had they called us in the first place. So we had to come in and fix their mistakes to give them the floor they originally wanted. We are here for you the client to give you a floor that will not only improve the space in your business or home it will modernize it and really sell the place to any visitors. 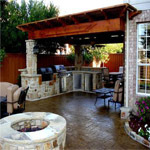 During the summer months most people like to use their patio as the place to entertain guests, have cook outs and just generally relax. That is why it’s nice to have an area that looks good and a place you enjoy. 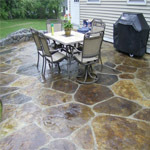 Sometimes you might have a large patio or just a small patio space; the only difference in what patio finish you want would be cost. 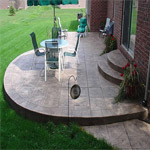 When you contact UAC Concrete Contractors we look at your existing patio and the foundations to check the integrity of them. We then see how level the patio is and look to see if water pools on any uneven surfaces. 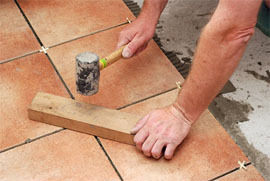 Our object is to provide you with an idle patio that will not only look great but will be even and sealed whilst providing a solid foundation base. 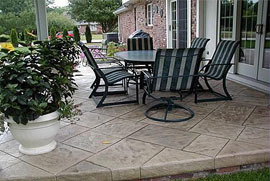 There are many patio designs and finishes that you can choose, from stamped concrete finishes that can resemble stone, cobblestone, sandstone, limestone or slate to name a few. You can even go with a stained and sealed concrete floor that is not only economical and looks great but it achieves the purpose of also being very easy to clean. 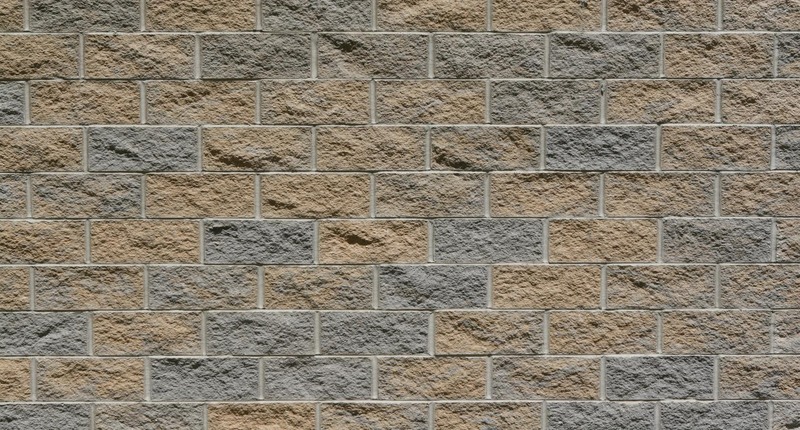 You can even think about a nice brick pattern design if you want to steer away from the concrete look. All you have to know is that we have a very diverse range of concrete finishes that will provide the perfect patio finish you deserve. 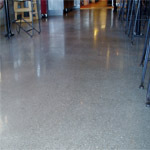 Our commercial team has been polishing concrete floors in warehouses and department stores for many years now. It provides a good alternative to epoxy or tile which can be a bit more expensive so this is where concrete polishing comes in to its own. 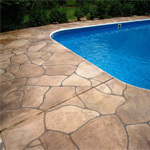 We have the ability to also stain the concrete to make it look like polished stone. We can get that expensive marble floor look through a technique that is well established by our company. As far as design goes we really can achieve whatever you desire, it just takes some time sitting with one of your contractors to enable your vision of how you want the concrete floor to look. Our contractors will point and steer you in the right direction and show you designs to scale your decision down to the exact floor look you want so there is no confusion before the job is started. Residential clients are some of our biggest customers as they want a good alternative to tile and many customers are having their garage floor, basement and even kitchen and dining room floors polished. 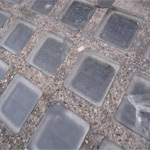 It is slip resistant and so easy to clean that no wonder it’s becoming one of our most popular services that we provide. 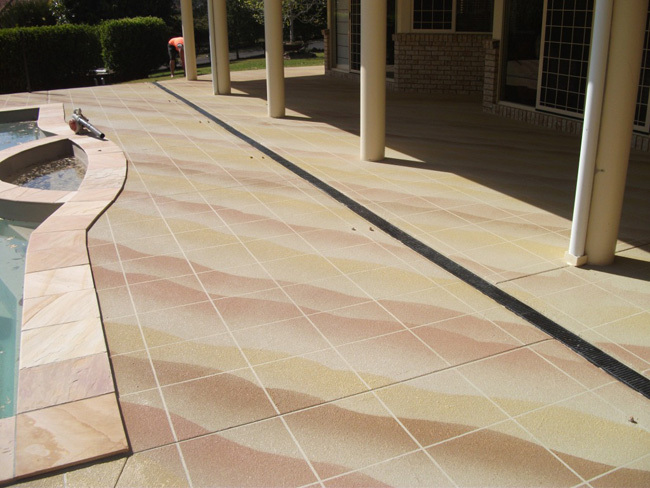 For more advice about how to achieve this look in your business or home, please contact one of our concrete polishing representatives and we will be happy to oblige in giving you a fantastic quote. A plain grey concrete slab is not the most thrilling thing to look at, not only is it a cold look to have it also provides nothing in the way of design. But what you do have is a blank canvas that can be turned in to something special. 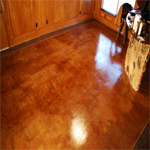 This is where we come in to give you the ideas of how to get that special finish out of the floor. 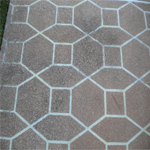 We have the ability to stain any bit of concrete that you have in your home or business, this can consist of patios, basements, pool decks, garage floors, walkways, residential floors and commercial floors. 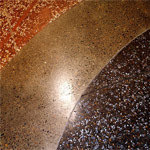 With a broad range of colors there really is no end as to what you can achieve on giving that concrete floor a new look. If you want something that’s not to “loud” in terms of color and more restrained then we can help with that. If you want something that’s really different then we can also give you that. 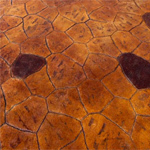 We have a range of stains and different design ideas that will really lift a floor to the next level. We have stained a good majority of business floors; this is something that’s common in big retailers because it can make a shop floor look really interesting and really reflects well on the look of the business. The final product will always look great and it will be the look you want, the contractor will work with you every step of the way to make sure your desired stained floor look is the exact finish that you wanted. We want things done right first time and we believe in planning because it makes for a perfect result. That is why we will always go above and beyond in the initial planning stages to get the best end result.